Having recently bought an Android phone, I thought it would be a nice endeavour to control a robot with such a device. Android being open-source, attracts a large following, and hence there are many different ready-made solutions that can be hacked into. A 8051 robot “Robo-51” (could be a robot with any other micrcontroller) with ZX-Bluetooth module, running a firmware for bluetooth control, and an account with App Inventor. The code is based on BennyBlue made with App Inventor. After being able to control the robot you will need to download the file Bluemote_1_0_a.zip (check the end of the article under the heading Update) that you need to upload in App Inventor’s Invent to see the full code and to compile the apk application for your Android device. For absolute beginners the excellent resources and tutorials found in App Inventor Explore, are very good and easy to follow. Before running the application you will need to pair the serial device on Robo-51 with your Android’s bluetooth. On connecting with the robot, you will hear “I’m robo-51… I’m at your command!”. 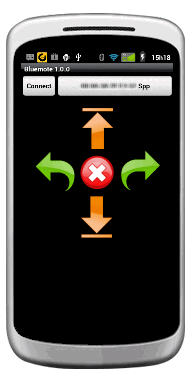 On controlling the robot, you will hear in your Android device “forward”, “backward”, “turning left” etc. This project adds into existing projects in this blog, with Robo-51 and bluetooth serial control. The main aim of this project was to achieve, with little work, similar results to those obtained with Java-based Nokia N97 and Blackberry Bold 9700. Effectively I can tick this project as successful. The layout has been improved as can be screen on the image above . The new source file is Bluemote_1_0_a.zip, kept at Bitbucket, an unlimited free private repositories’ site. This entry was posted in Mobile Apps, Programming, Robotic Projects and tagged Android, BlackBerry Bold, Bluetooth, MIT Scratch, Nokia N97, Robo-51, Scratch, Zx-Bluetooth. Bookmark the permalink. Iam doing same project but blutooth controlled solar powered robot. working on atmega8.I need details about android controlling robot via bluetooth.how to develop application for it.